Im too exhausted watching these home games to write about anything. I will ride Alan like a rented mule for his take on this. Maybe the K's should wear the orange jerseys on Wednesday. On an lol note..a study done says long wooley beards may contain the same amount of microbes as a typical toilet bowl. .so stay away from Lampl's face. Well, RG2, I'm just like everyone else on this one. I was on the "edge of my seat" the entire game. I still think Toledo is faster. I think they move the puck much better. But that doesn't mean the Komets can't win. They need to keep doing the stuff that negates those advantages. Putting the body on Toledo is so important. 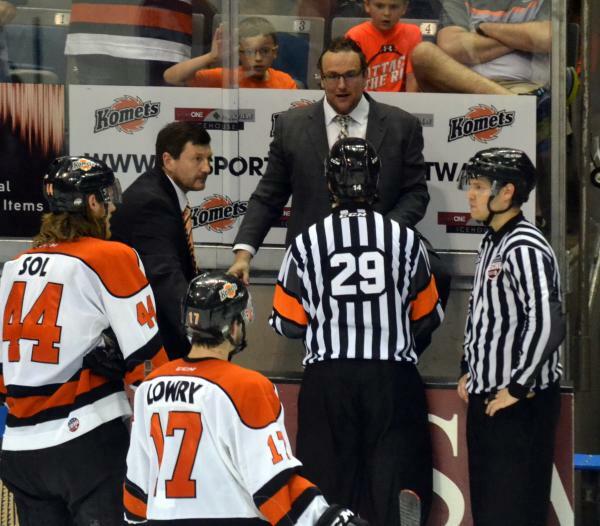 Wheeling gave the komets a perfect blueprint and I think the Komets thought they could do it their way. They are starting to play "good old Komet hockey" and it is starting to pay off. I have always disagreed with anyone who has stated that finishing ahead (in the standings) is trivial. Especially when your road record is so sterling. That's hogwash (I could've thought of better words). I wish we were playing game 7 at the Coliseum. And I totally agree with RCBoater, who above, posted the idea of wearing the orange sweaters. COULDN'T AGREE MORE. Switch things up. Have a different look. Haven't won in that bulding wearing black or white. Use those orange jerseys. Gosh, for a guy that usually chooses logic over emotion, creating a new "karma" is a strange pathway. Or...do what the New England Patriots would do. Deflate the puck!! gonna have to get on the orange sweater bandwagon also. Alan, keep up the heavy lifting on the blog post. Always enjoy your words no matter what. Call the Komets' office and suggest it. It's worth a shot.